Today’s quads were headlined by a six player master swiss. The legendary IM Jay Bonin finished first with 3/3, and FM Leif Pressman took second with 2/3. Derek Meredith and and Eric Zhang tied for first in quad two in which the rating gap between the top and bottom seed was only 65 points! 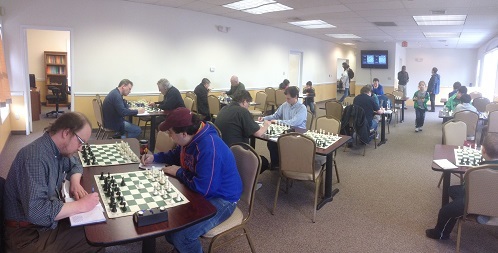 Dennis Li, Joseph Bihlmeyer and Leo Bykhovsky all tied for first with 2/3 in quad three. 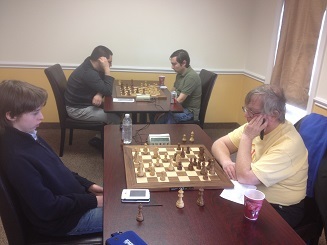 Li and Bykhovsky both reached new rating peaks! The favorite in quad four, Garrett Browning, won with 2.5/3 after a last round draw against Scott Buono. In quad five it was William Ewald who took first place honors with 2.5/3! William’s brother Thomas won the final quad with a perfect score and gained over 100 points for his efforts!